September 9 – iPhone 6S and 6S Plus! You are at:Home»BUZZ»September 9 – iPhone 6S and 6S Plus! 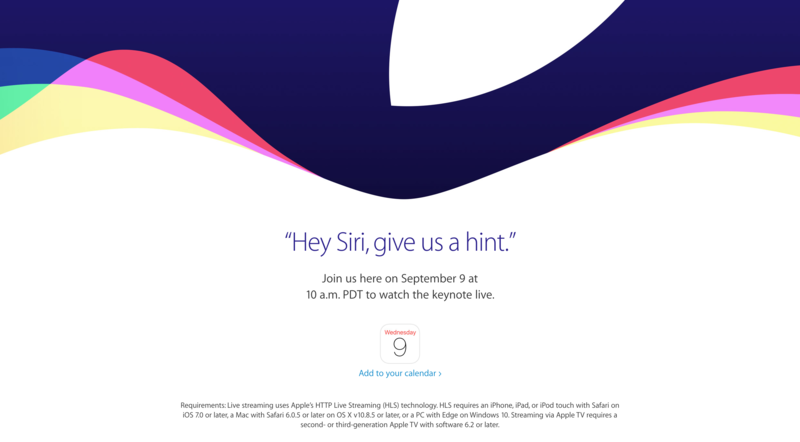 Apple will be hosting an event on September 9, 2015. If Apple follows tradition, both the iPhone 6S and the iPhone 6S Plus will be announced, with the possibilities of other gadgets; such as, an updated Apple TV, or (unlikely) the iPhone 6C. The invitation reads “Hey Siri, give us a hint.” However, Siri, the personal assistant on iOS, shows more charm, wit and humor. We don’t want to spoil the surprise – go ahead – ask Siri. The iPhone 6S and 6S Plus are rumored to have a force touch display. Personally, this reminds me of the BlackBerry Torch, and its terrible tactile display. Apple will more than likely execute this force touch display in a better manner – hopefully, this doesn’t affect the already hefty price tag on these devices. In addition to the force touch display, the iPhones will receive a spec bump. Everything from a higher MP count on the rear camera, currently rumored to go up to 12MP, possible higher RAM, the capacity to record in 4K. A fourth color maybe introduced as well, a rose color device to compliment the current iPhone 6 palate, silver, gold and space gray. The rumored (and highly unlikely) iPhone 6C would offer more different colors like the previous iPhone 5C. Are you looking forward to the next iPhone? What features do you wish it would have? Tweet us @AsianGeekSquad.